Are you new to cooking? Are you confused about the kitchen essentials you need to buy? Here, this article will help in providing you with information regarding different kitchen essentials. We have mentioned different types of kitchen essentials, a buying guide, our top picks, why kitchen essential is necessary, and a few FAQ. Cooking is fun only if you have proper kitchen essentials. If you look for kitchen essential, then there is a long list of kitchen items and among that Indian cooking, utensil list is altogether different. This may lead to too much confusion. Hence, we have picked only the regular and the most used ones. Also, every kitchen essential mentioned will be used daily. Kitchen tools or kitchen essentials help to cook easily with great ease. Also, kitchen essentials enhance cooking in a more healthy way. We are ensuring perfect taste and texture. Now, cooking will be easy with equipped kitchen. We start with a basic kitchen tool or kitchen essential but we have also included the advanced kitchen essential in this article. In this article, we have mentioned types of kitchen essentials, why do we need kitchen essentials and a comprehensive buyers guide. Lastly, we have also mentioned Our Top 15 recommended products that you can buy online and FAQ’s to solve any of your queries. Why do we need a kitchen essential? Cooking includes a lot of activities starting from chopping, storing, mixing, grating, shredding, and cleaning. We have seen different types of kitchen essential, and each has its use and benefits. A perfect kitchen essential products help in making things simple, easy cooking and faster. For example, a food processor can do a lot of things like mixing the doughs, slicing, shredding. This reduces the amount of time invested in doing it manually. Advanced cookware uses less oil, and we became health conscious. Cooking is really fun but without proper kitchen tools the job will become more hectic, and we get tired very soon. The perfect tools like measuring cups help in using accurately measured ingredients especially when we are trying with new recipes. This ensures good taste and perfect taste. Measuring cups or Measuring Spoons are widely used for the measurement of ingredients. It is not necessary that cups and spoons are used only for measuring dry ingredients. They can also be used to measure liquid materials. 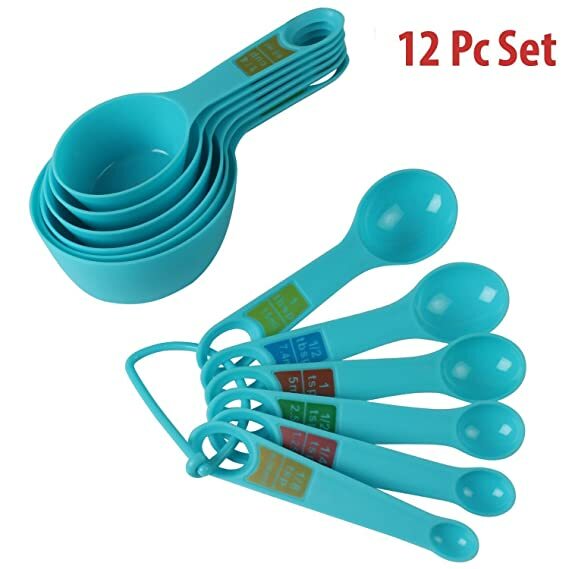 Generally, measuring cups and spoons are available in different measuring spoon sizes like 1, 1/2, 1/3, 1/4. Measuring cups will be bigger than measuring spoons. Chopping boards are also known as cutting boards that are used widely in the kitchen. For cutting, chopping and slicing vegetables you need to place them on the board to chop properly. This helps in even cutting and also as per the shape and size required. Chopping Board wood are considered to be the best choice. Storage boxes or storage jars are widely used for storing groceries. You can not keep your packed or loose grocery simply in a place. Otherwise, they will be damaged. To avoid your grocery from getting worse, they must be placed in a jar or box. 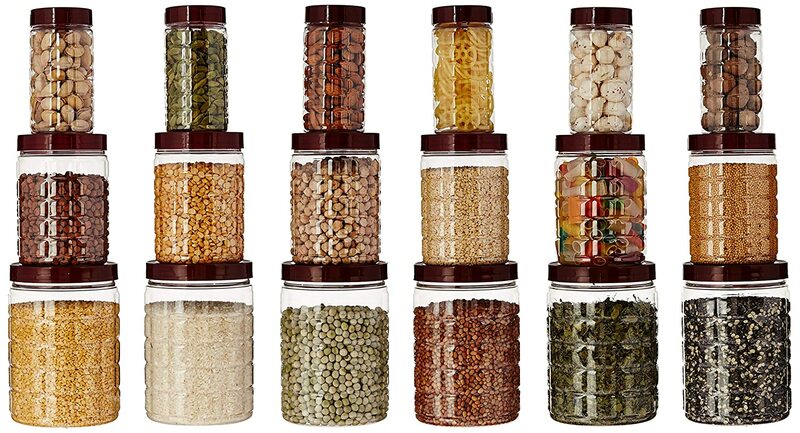 Usually, storage jars or boxes are available in the market in different types. Also, storage boxes or jars can be found in different shapes and sizes. Also, the opening of the jars or boxes is also in different styles. Few jars come with an easy open-close lid, few come with a round full-lid open, and few jars have airtight lids not allowing any moist or air inside — this help in storing the food easily in a place in an organized manner. Spice racks or spice storage containers are mainly used in Indian kitchens for storing different spices. Spices are stored in small containers for daily use. A spice rack may be hanged to the wall or maybe on revolving stand. Traditionally, the spices used daily are stored in a round or squared shaped box with small containers in it. The modern spice racks are more convenient to use and can be stored safely. Blenders or liquidizer are commonly used to make smoothies, purees or liquefy the food ingredients. Immersion blenders and container blenders are two types of blenders. Immersion blenders have rotating blades at the bottom and do not have any own containers of own. While container blenders have their container made of plastic or steel or glass with a blade in it. A kitchen appliance that is used to mix, grind, chop, or to make a puree. It can do plenty of things like blending the milkshakes, preparing juices. Also, some food processor can do the work of a normal grinder of preparing chutneys or making dosa batter or idli batter. Any best food processor needs either a small amount of liquid or no liquid to get the work done. Also, they use different blades for different purposes. A mixer grinder is the combination of mixer and grinder and is used for mixing, grinding, blending of different ingredients. It has two or more jars one for making wet sauces medium sized for making dry powders and a small one for chutneys. 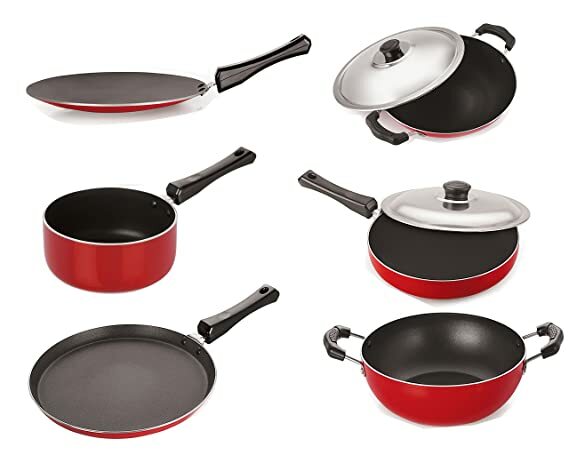 A cookware set is used to prepare various kind of foods. They include one or two different kinds of pans, a tawa, and other utensils. Each has its feature to be used. For example, pans are used for frying things or preparing sauces or even for sauteing. A bowl ideally suited to mix all the necessary ingredients while preparing food. Mixing bowls can be made from glass, steel, plastic, and ceramic. 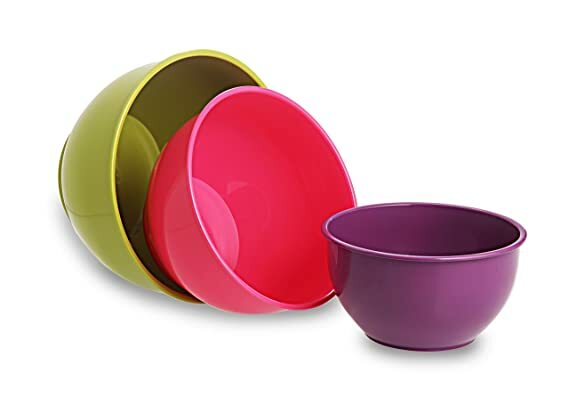 Also, the mixing bowls can be of different size. Ensure that the mixing bowl has high sides to prevent spilling of the mix. Dinner sets include few plates, serving bowls and using bowls. They are used for dining. Materials like crockery, steel, plastic are used in making the dinner sets. Cooking and eating is fun, but the toughest part is to wash the dishes and dry them. Here, comes dish drainer in handy. They are used to drain the washed utensils in a more simpler form. All you have to do is simply put all the utensils in the dish drainer after wash. Let it allow to dry for an hour. Graters are also known as the shredder. They make the food into fine pieces; also they can be used in various food preparations. The different grater has different designed slots or a single slot. Grated food easily melts or cooks easily. Masher or crusher is used to mash the soft food to light texture. They are used to mash boiled potatoes, beans, chickpeas, melon, etc. Various designs are found in mashers. Also, mashers may be either steel or wood. Few mashers have a round bottom, or few mashers have a zig-zag bottom. Mashers can be used only for cooked food. A colander is also known as cullender, are usually light in weight. They are used to drain the water from washed leafy vegetables or fruits or any kind of vegetables. Also, they can be used to wash the rice and other grains. They are made of either using plastic, steel, silicone, aluminum. Colanders can also be in different shapes or sizes. Few colanders may have tiny holes completely to a bowl while few may have holes at only one side. Pots are used to prepare complex recipes. Also, different pot is used for different purpose. 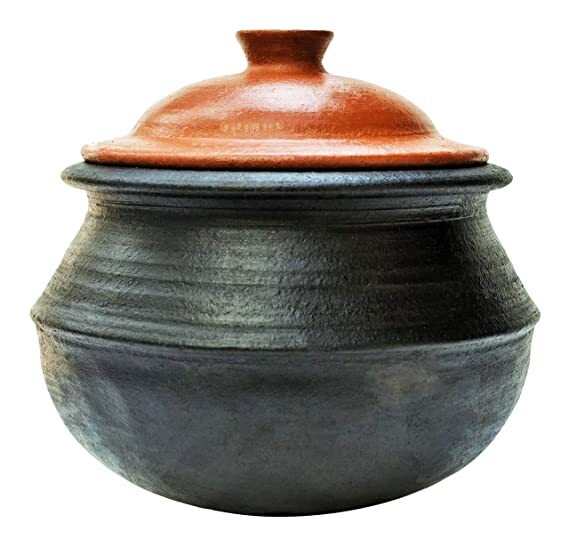 Moreover, pots like stock pots are also used to store the food. If you are using clay pots, then seasoning is a must. Size is the most considerable thing to be checked before buying any kind of kitchen essentials. If the size of your chosen product does not match your requirement, then it will be of no use to you. Size must be considered even if you are buying a basic kitchen essential as a knife. As we know they come in different size and one for chopping the vegetables cannot be replaced with a knife that is used for spreading cheese or butter on bread. Hence, size matters while buying any sort of kitchen essential. You are investing your money on things that are necessary for you to enhance your ease of cooking. If the product you are buying is not durable means your money gets wasted. So, products which are durable can be used for a long period. Design of your kitchen essentials must be attractive; they must not be unattractive. For example, the design of the salt and pepper grinder is so attractive that you look forward to buying the product. Also, the design of the product must be in such a way that it must be comfortable for you to use it. Moreover, the design of any kitchen essential should not be such that it looks fancy but not works actually. The product you are looking for must be economic-friendly. Most of the kitchen essentials are made of either bamboo, glass, stainless steel, silicone or fine quality plastic. Products based on plastic are more prone to damages and also are not considered safe to use in the long run. All the products mentioned below are made using premium quality and safe to use. If any product comes with a warranty means it is a plus for you. A warranty helps you to replace the product on receiving a damaged one. Also, if any minute parts are not working, warranty helps in receiving the parts. At the top of all warranty will be considered only when you contact the brand in the given time. Never end up in buying a kitchen essential that is overpriced. For example, if you are looking for a masher, we have different styles and different brands available. So, the product which comes for a lesser price compared to other brand and has a strong build quality must be chosen. Jadhav E-comm Innovations an Indian company owns Cafe JEI. In 2017, the company was established. Their products are well designed and innovative. Also, has good user ratings as the products are made from premium-quality. Their products include different types of coffee press and a knife set. The knife set has a uniform long lasting blade which is made from stainless steel. Anti-slip handle for holding the blades firmly. It has perfect sharpness and has an ergonomic design. Moreover, the knife set is easy to clean and maintain. Borosil Glass Works Indian Ltd. was established in 1962. They work in collaboration with leading USA based Corning Glass Works. In India, Borosil is the leading market leader for microwavable kitchenware and glassware. Their products category includes scientific and industrial, consumer, lighting and much more. Now, kneading a wheat dough, preparing a salad, shredding vegetables has become easier. The product is well-designed and is durable. Moreover, it can resist to 300 centigrade temperature. Moreover, they do not leech chemicals into food. Living provides all types of kitchen essentials which are made from premium quality. They maintain good standards and also has great customer service for any type of product chosen. All their products have good user ratings and accepted by a wide range of people. Their products include sponge, knife set, glitter pens and much more. Now, you can cut, chop, slice fruits and vegetables easily using the chopping board. 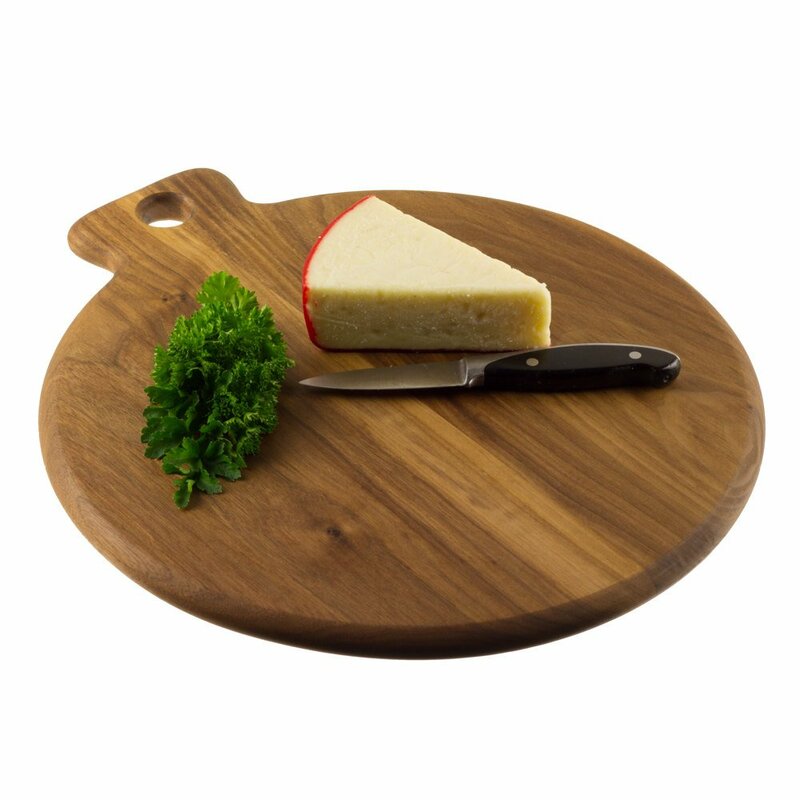 The chopping board is made using good and premium quality bamboo. Also, the kitchen surface will not be damaged by using the chopping board. Moreover, it is easier to clean and also on a problem with the product you can contact customer care. 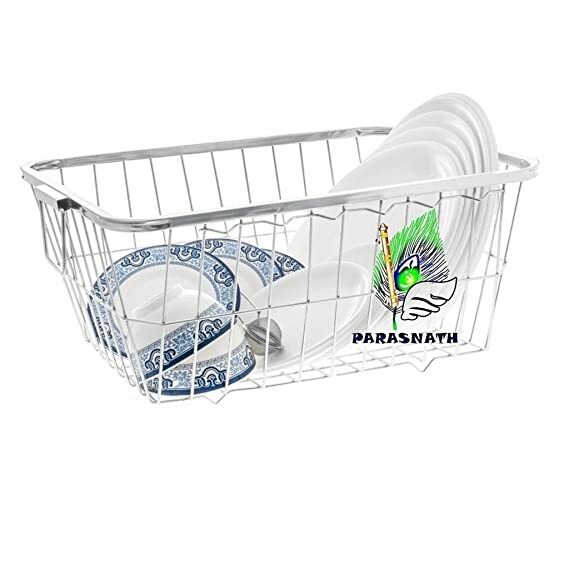 The high-grade stainless steel dish drainer is the product of Planet company. Their products have attractive and unique designs to satisfy the customers. Also, they are made from premium quality material. Their products include a folding towel rack, plate stand, mirror cabinet and much more. The stainless steel dish drainer is coated with silver color. It comes with plastic grip handles for easy lifting. Also, the four legs at the bottom allow the water to drain completely and easy to move the drainer. A unique design of the wiring helps in easy storage of utensils. Flatan ware is an Indian company established in 2012. It offers a wide range of quality products. Also, their products are highly durable and tested. Their products include spice racks, peeler, vada box, masala box, coconut cutter and much more. The Flatware colander is used to strain the vegetables, rice, pulses and many more. It is well-designed and easy to clean product. Also, it can be used for storing washed fruits and vegetables. Moreover, it is portable. Machak as a brand offers multiple kitchen cookware and essentials. 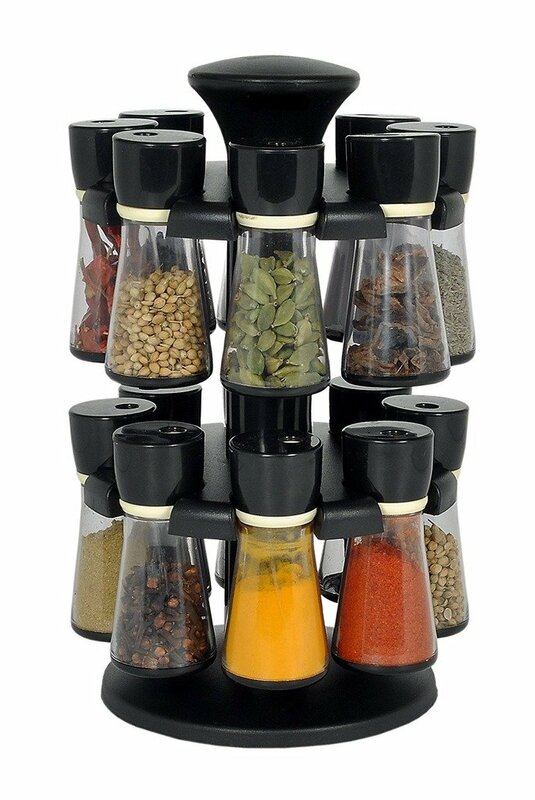 This 360 turn spice rack will surely make your kitchen look modern. The spice rack consists of 16 bottles which are more than enough to store all the daily used spice. If you want to have a put-together look for your kitchen then this spice rack will have all the spices at one single place, saving space and convenient. Inalsa is founded in 1967 and is a subsidiary of Taurus Groups. It is the leading home appliances company. Also, their products meet ISO standards, and they provide high-quality goods. Their products categorized into cooking, breakfast, food processor, heating appliances, and personal care. 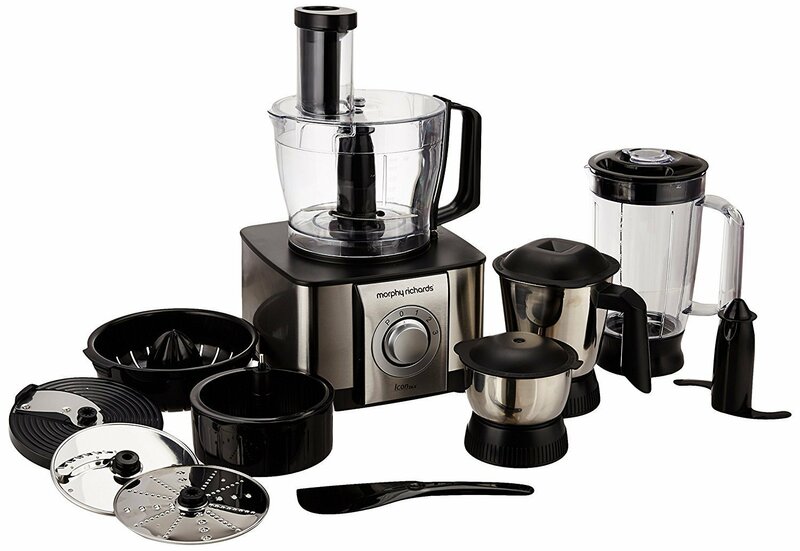 The food processor comes in an attractive black/silver color. It enhances the experience of ease of cooking. Now, you can finely chop, slice, shred and mix doughs easily. The product claims it has 100% copper winding. Additionally, a special feature of child security lock is also provided. ORPIO (LABLE) has a wide variety of products available. All their products are designed innovatively and satisfy customer needs. Their list of products includes microwave splatter lid, cosmetic storage box, silicone waterproof toothbrush holder. The refillable salt and pepper grinder is easy and more convenient to use. It comes with durable ceramic plates. Also, the grinder allows grinding the spice into fine, medium and rough textures. It has a strong build up quality and durable. Kitchen Bazaar has a wide range of products like containers, drum grate shredder, citrus juicer, vegetable chopper and much more. All their products are made of good quality and well designed. The 12 piece set of containers are easy to clean and maintain. Also, it has four-sided locking lid with silicone seal. Moreover, pouring food items has become easy. The containers can be used for multiple purposes and are designed ideally. MeRaYo has a wide range of products like bathroom accessories, desktop organizers, self-adhesive wall mounts and much more. All their products have good user ratings and designed to meet customer needs. Now, baking and cooking have become easier with perfect measurements. The quality of the product is excellent. Stylish ready to use measuring cups and spoons have good durability. Labels might rub off on regular use. Expresso has a wide range of stainless steel products which are designed to satisfy the customers. Their products have good user ratings and used widely. List of products includes grater, bottle dispenser, filter, lunch box, plates, straws and much more. Professional grater can perform six functions. Look and feel of the product is excellent. Also, the blades provided are sharp. Rubber bottom at the base helps in avoiding slippery. The hexagonal shape helps in easy use. Now, shredding has become easier and faster. Pigeon Stovekraft limited is an ISO 9001:2008 certified company. 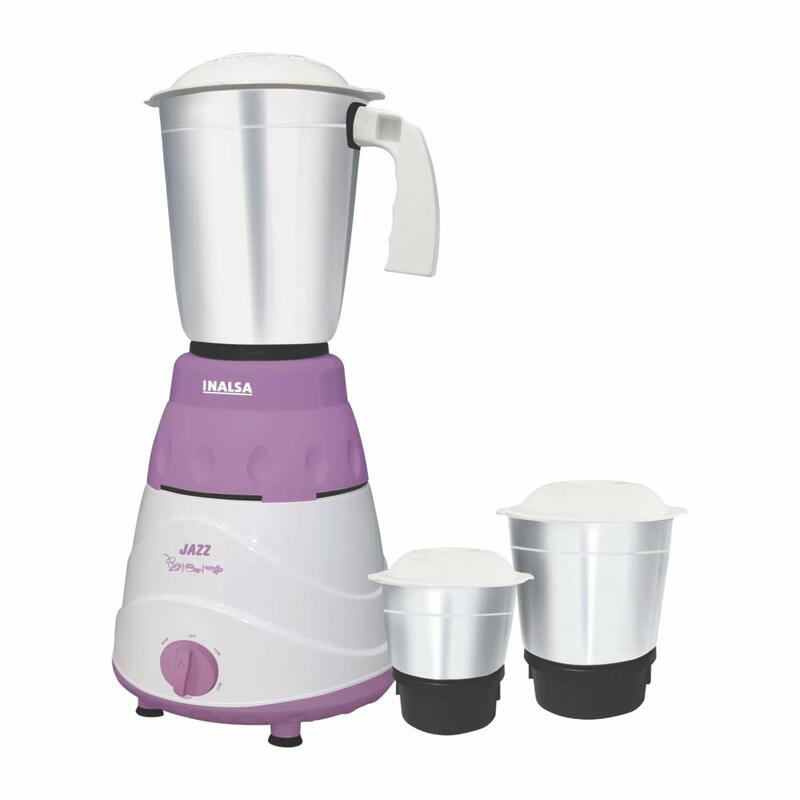 It is the leading kitchen appliances company in India. Stovekraft started in 1994. All their kitchen appliances are designed to benefit the customers. Their wide range of products includes induction stoves, gas stoves, electric kettles, choppers and much more. The pot is ideal for a large family or to cook food for 8 to 10 people. Easy grip plastic covered handles help in the easy carrying of the pot. Also, a steel spoon can be used for this pot. The lid sits firmly on the pot. Moreover, the product has a strong and sturdy build. Hawkins cookers limited started in 1959. All the Hawkins cookers are tested before they are out. Their category of products includes pressure cookers and Futura cookwares. Their products come with a warranty. The pressure cookers are designed ideally to suit both gas stoves, and induction cook tops. The Hawkins Futura cookware is made from heavy gauge aluminum. Each pan is coated with advanced technology. Sturdy and comfortable handles help in an easy grip. Hawkins Futura provides a better experience of the cooking. This masher is the product of Ganesh company which have a wide range of collection. Their collection of products include hand blender, chopper, dry fruit cutter and much more. 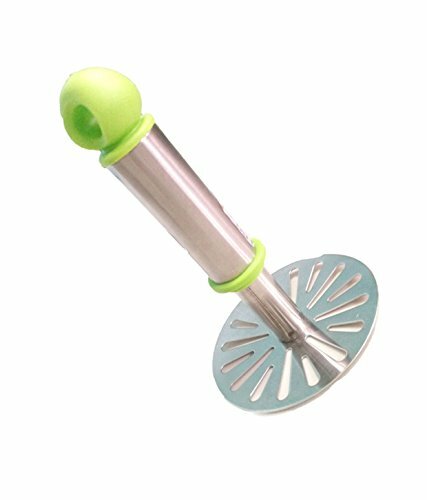 The masher helps in softening the boiled vegetables, uncooked tomatoes, and juicy fruits. It can be used daily or especially while making pav bhaji and paratha stuff. It is made of stainless steel. 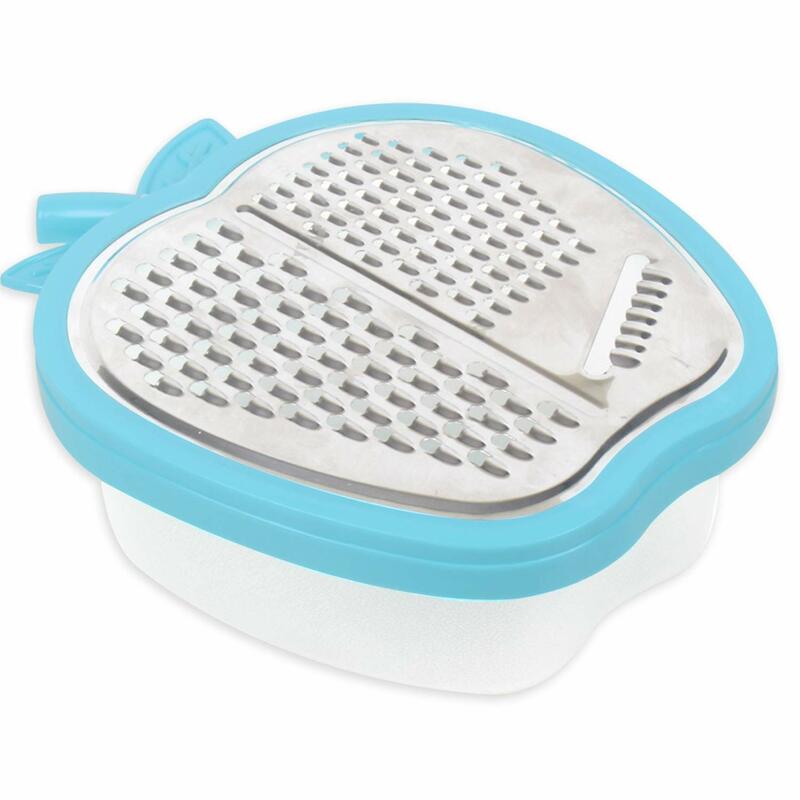 The round steel base helps in mashing the vegetables evenly. Cello is a leading manufacturer established in 1967. Cello has in total of 18 factories located at different places. Their products are designed innovatively as per the customer needs. Their wide range of products includes glassware, kitchen appliances, bathroom accessories, storage containers and much more. It is an Indian product with European standards. It follows German technology in creating products. 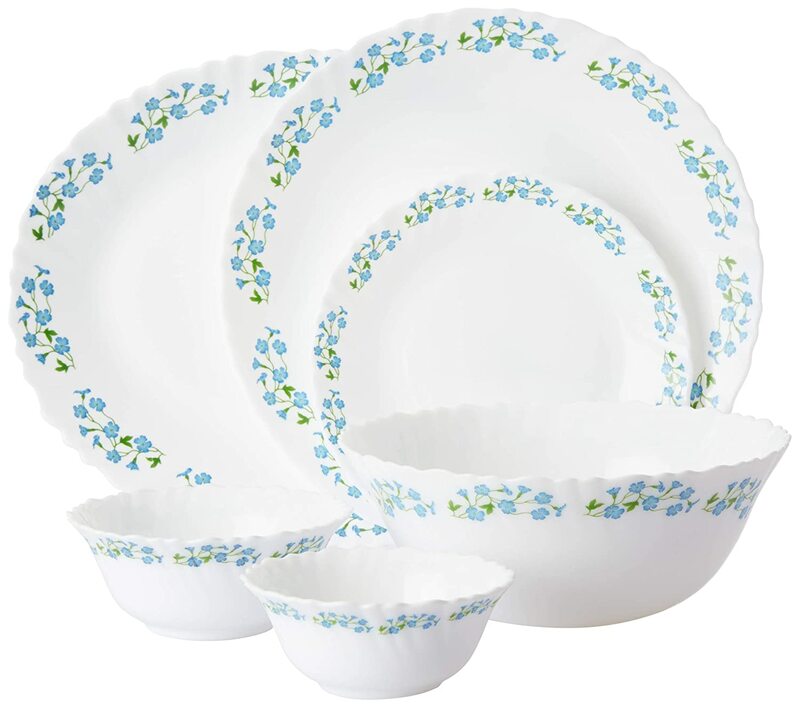 The dinner set is very helpful for daily use and can be used in refrigerators, microwave. The hygienic dinner set is free from nonporous. 1. Is a chopping board with wooden is best or plastic is best? If you are looking for an environmental friendly chopping board, then choose a wooden board as plastic is melted with including lot of chemicals. Above all, any chopping board needs a good amount of maintenance. Clean your chopping board after every use. Ensure the board you are buying is made from premium quality. 2. What are the main features to be considered while buying a food processor? A food processor must contain all features of doing things that a blender does, and a wet/dry grinder does. Also, the capacity of the bowl must be considered as there must be easy mixing. Moreover, power consumption and motor details must be known before buying. 3. What is the necessary thing to be considered while buying a knife? The knife must be sharp and have easy grip holders either of wood or plastic. Also, if you are looking for a set of knives then ensure that it includes every required knife you are looking for. Moreover, the knifes set must include different knives used for different purpose. If you have reached this part of the article means you are looking for a kitchen essential. I hope this article satisfied you and you have known the information you are looking for. After good research on different products, I have chosen a starter knife set from cafe JEI as the best one. I consider a knife as the basic kitchen essential. 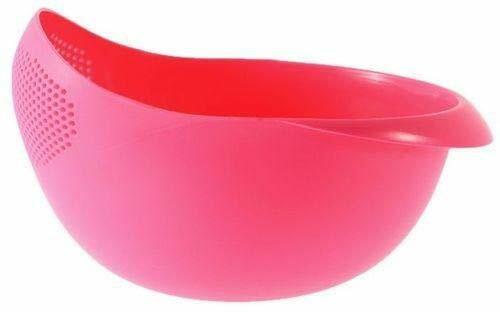 A standard mixing bowl from Borosil aids in easy usage also the transparent see-through helps to see and avoid any lumps exists. An advanced kitchen essential like Food Processor helps in doing multiple functions. If you want to buy any of the products from the list mentioned from our picks then simply click on the link provided.